Spyderco Salt Knives as Anti-Shark Defense Tools? Re: Spyderco Salt Knives as Anti-Shark Defense Tools? Sure, you're likely SOOL if you're attacked by a shark. But if you carry a fixed blade on your hip, it is not far fetched to say it can save your life. Most sharks will latch on to one of your limbs. You grab the knife and stab them ASAP. If it has good blade shape for stabbing it should penetrate their skin fairly deeply, in which case they will most likely let go and leave before they cause you more harm. I would MUCH rather have a knife than be without one if attacked by a shark. The Naval Base I work on is one of the East Coast Bases for our Clearance Divers, the equivalent of your Navy Seals and I’ve had the privilege of meeting one in particular named Paul De Gelder. Paul was bitten by a Bull Shark one morning about ten years ago in Sydney Harbour and lost a hand and leg. Talk to him for a couple of minutes, then tell me about the best shark knife and the best place to poke one when your being crushed in it’s jaws and drowning. P.S. Paul wrote a book which I haven’t read but by all accounts is a great read. Punching didnt work too well for the crew of the USS Indianapolis either, when the survivors of the sinking had to spend time in the water and encountered sharks. Last edited by SpyderScout on Sun Oct 28, 2018 5:40 pm, edited 1 time in total. Bloke, having lived on the coast my entire life I can also get you in touch with several people who firmly believe that their dive knife has saved their life during both shark attacks and encounters. There are countless accounts of people saving themselves simply by punching the shark. I'm having trouble seeing a knife as useless in these scenarios. Frankly, because i know it's not. To clarify further, while I'll always agree that if a shark wants you, he can essentially always get you, a knife has the potential (not implying in every scenario) to make him no longer want you. Hey Hitch, I certainly agree that an inquisitive shark may well be sent on it’s way with a fist, speargun, camera, knife etc. smacked on it’s nose. It happens regularly. But that’s an inquisitive shark. The shark that decides to attack you, you either won’t see at all or you’ll see it as it attacks. After you’re bitten the damage is done so what’s it matter what you attack the shark with? It’s like saying I got hit by a bus but I managed to throw my phone at it and I cracked the windscreen. i’m ready for all the sharks! Not all situations are the same. The damage isn't always done, per se. Sometimes, sure. But many times they don't get a proper mouthful and try to grab more meat before they shake back and forth, severing the limb clean. These crucial few seconds are where you can deter him from removing the limb or biting more than once. Unlike the bus, when the shark bites you have access to the shark's most vulnerable spot (his head/eyes) as it's literally attached to you. Luckily I haven't had a close shark encounter while diving, but I've always had my knife already deployed. I assure you that stabbing the shark in the head as soon as he latches on is a good idea. I'm not saying a knife is guaranteed to save your life as you seem to imply, that would be moronic. Again, numerous people have gotten sharks to leave after one bite simply by punching them in the eye before they could remove the limb or bite again. Bull sharks in particular have a serious attitude problem and can bite multiple times, so further (lethal) damage can certainly be prevented. I am certainly not attempting to paint such scenarios with a broad brush. Hopefully it can be seen that I'm doing just the opposite. The behavior of sharks is largely foreign to the masses. They're big and scary and a human in the water is akin to a fish out of water. But there are way, way too many survivors of attacks that are certain their actions saved their life for me to adopt the "if a shark attacks, you're as good as dead, gone, the end" mentality. Not all situations are the same. However the average surfer, and swimmer (here in Oz at least) does not have a knife close handy and even if they did you'd have to ask would they be able to reach it and would they be able to poke it in the sharks eye, nose, gills, underbelly or wherever it is you're supposed to poke or stab sharks? Let's not act like I stated this was a pleasant scenario, lol. Luckily I haven't had a close shark encounter while diving, but I've always had my knife already deployed. I never quite got the use of the term 'deployed*' in regards to knives. Ive seen it used instead of 'opening' (why is beyond me). What do you mean in this instance; that you always swim around with your fixed blade ready in your hand or that you have a folding knife in the open position some where on you or ... ? * Personally I open a knife. I got deployed to the sand box. Fixed blade in hand when near a reef. I've stayed out of this thread because...well, because I know better, but whatever, here goes. I think there are too many general opinions being stated as fact. Like Pelagic said, "If a shark decided to attack you, you are screwed" is not an accurate statement. The thing is though, the result of a shark attack would depend on SO many things. Top of the list would be "how big is the shark?" Two people could be arguing over how dangerous a dog is but if when saying the word "dog" one is imagining a chihuahua and the other a Rottweiler then they are going to have a hard time reaching the same conclusion. Sharks come in lots of shapes and flavors. A guys impression of what it was like being attacked by a 12' Bull shark will be a lot different from another guys experience being bitten by a 5' Blacktip. Though that would be the main factor, there are countless other questions to ask and without the answers then the original question is too vague to even be considered. What type of shark is it? Is the Shark hungry or curious? Is the shark attacking you or a fish you are holding? Do you see the shark before it attacks? Do you have the knife in your hand before the fish attacks or is it tucked away somewhere? Where does the shark initially bite you? Arm, leg, face or vital organ? One of the most important questions is how scared are you? A fisherman or spear fisherman who is very used to seeing and dealing with sharks will react much more rationally in that scenario. If you are panicking and spazzing out then you'll probably have no more success with a knife than you would flailing around bare handed. I don't think anyone is completely wrong on this subject, there is truth in everyone's post, but the real answer is "it depends". There are definitely no absolute answers. If you are saying that a knife will always change the outcome of a shark attack then you are definitely mistaken. Try that theory when a White Shark hits you full speed from behind and body parts start flying. If you are saying that a knife is useless in a shark attack then you are definitely mistaken. As Pelagic said, there are numerous stories of people deterring attacking sharks with nothing but their hands and fists. Spear fishermen commonly deal with aggressive sharks with their spear gun and less commonly with a dive knife. I caught a 5'-6' Whitetip yesterday on the kayak. I brought him in and saw that the circle hook was barely hooked in the corner of the mouth and brought him close to the kayak to try to release him. Rather than trying to control him and remove the hook with pliers, I planned to cut the little piece of skin holding the hook with my caribbean. The shark was thrashing around and head whipping but it wasn't really a nervous affair. I have done this a hundred times and I have a fair bit of familiarity with these fish, and that's all it is...a fish with sharp teeth. You've got to be careful and respectful obviously but it's still just a big ole fish. I can tell you for sure that if that little guy and I were both in the water (both aware of each other) and he had his teeth and I had a knife then he would be the one in trouble, not me. That's not me trying to sound like a sea ninja, that's just reality. If he were a different species of a different size then the story line would change. It just depends. Anyway, I think I have a quick video of that shark encounter yesterday. I'll look and if I find it I'll post it here later. This thread is one big hypothetical with more variables than Chins in a Chinese phone book. 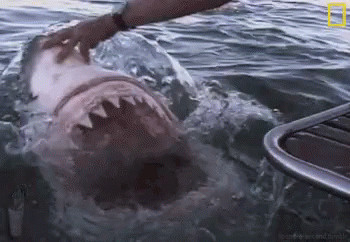 The interwebs have proven, that a shark CAN be punched! That dude is something. Personally, I cant do the crawl with my boxing gloves on. 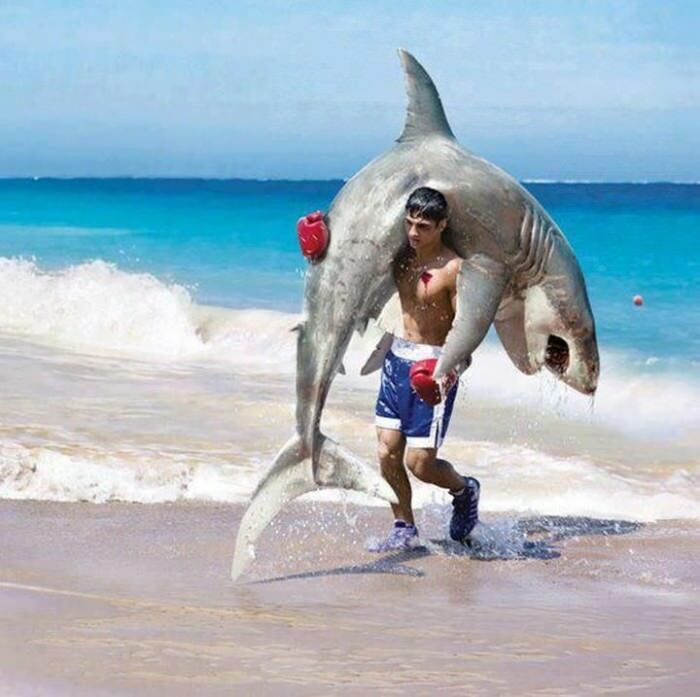 Also doesnt exactly make it easy hitching up the Speedos after a fight with shark. I agree with what 'gringo said and also with Bloke saying, that this shark debate is very hypothetical ... to say the least. I believe somebody punching or knifing a small enough shark can get away with it. If a White or similar bent on attack is comming at you, it will very likely be goodbye-time. Even if one manages to dis-entangle one self, the wounds often seem to be horrific. Here’s the video from yesterday. Be advised, this doesn’t really have anything at all to do with the topic. We were just talking about sharks and knives and I happened to have a video from yesterday with both sharks and knives in it so I thought I would share.